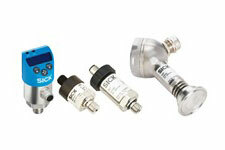 SICK sensors’ offering of pressure sensors is tailored for a wide variety of factory automation solutions. The Sick pressure switch PBS and the Sick pressure transmitter series PBT and PFT are well suited for general industrial applications such as machine and plant engineering, machine tool systems, hydraulic and pneumatic systems, pressure control systems, and pumps and compressors. The Sick pressure sensor devices are distinguished by their robust performance, high quality and simple applicability along with their compact dimensions and convincing price-performance ratio. CIMTEC Automation is an authorized SICK sensor distributor and can recommend the ideal fluid level sensor for any industrial application. Our in-house technical support team can help integrate the right sensors into any automation control scheme to optimize the superior quality and precision of SICK’s sensor products. Click here to find part number or manufacturer number, then enter the number in the search box below. 6041223 PBS-RP160SN1SS0AMA0Z PBS PRESSURE BASIC SWITCH, GAUGE PRESSURE (RELATIVE), 0...160 PI, ACCURACY +/- 1% OF SPAN (BFSL), 1/4 NPT, STANDARD, PROCESS TMPERATURE -20...+85 DEGREES C, WITHOUT SEALING, 2X PNP, M12X1, -PIN, IP67, 15...35 VDC, NO SPECIAL OPTIONS. 6041346 PFT-FRB1X0SF1OSCUMSSZ PFT PRESSURE FLEXIBLE SWITCH, GAUGE PRESSURE (RELATIVE), 0...1 AR, ACCURACY +\-0.5% OF SPAN (BFSL), G1B FLUSH-MOUNTED WITH O-RNG, FLUSH-MOUNTED MEMBRANE, -30...+100 DEGREES C, FLUSH-MOUNTEDCRNI-STEEL + FPM/FKM O-RING, 0...5 V, 3-WIRE, M12X1, 4-PIN, 14.